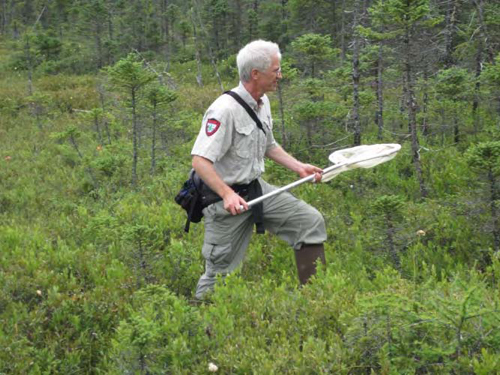 Dr. Phillip deMaynadier has worked as a wildlife biologist for Maine's Department of Inland Fisheries and Wildlife for 16 years where he currently serves as Leader of the Reptile-Amphibian-Invertebrate Group. He has authored over 30 peer-reviewed scientific publications, is active on several State and national nongame wildlife technical committees, and serves on the Graduate Faculty at University of Maine’s Department of Wildlife Ecology. Some of his recent projects include a) co-coordinating completion of the 2015 Maine State Wildlife Action Plan, b) managing the State’s program for protecting high value vernal pools, c) conducting a climate change vulnerability assessment of Maine biota, d) coordinating state atlasing efforts for butterflies, dragonflies, amphibians, and reptiles, and e) advising agencies, landowners and land trusts on management guidelines for rare and endangered species. Phillip received his doctorate in Wildlife Ecology from the University of Maine in 1996. Invertebrates, smaller organisms lacking a backbone, are the dominant form of life on earth both in diversity and biomass (living weight). It is estimated that Maine alone hosts over 16,000 inland species of invertebrates, comprising approximately >95% of the State's animal life. Whether insects (butterflies and bees), crustaceans (crayfish and fairy shrimp), mollusks (snails and mussels), or arachnids (spiders and mites) -- to name a few groups -- Maine’s invertebrates are both fascinating in their diversity of form and function, and critically important for sustaining natural ecosystems. The famous Harvard biologist Edward O. Wilson refers to invertebrates as “the little things that run the world” because of their life-sustaining services in crop pollination, soil enrichment, seed dispersal, waste recycling, biological pest control, and food chain support. On this last point, consider for example, that most of Maine’s more conspicuous wildlife -- birds, bats, amphibians, reptiles, and fish -- are insectivorous for at least a portion of their life history. In part because of the essential ecosystem services provided by invertebrates, MDIFW takes its charge to conserve all of Maine’s wildlife seriously.